Q: What disease starts as a sore throat in children and ends with open heart surgery, heart failure, permanent disability, stroke and premature death? 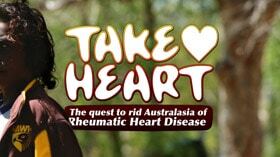 Take Heart is a global film-led, media communications initiative designed to put Rheumatic Heart Disease (RHD) on the global media and public health agendas. Take Heart will be distributed across a variety of platforms including public theatrical screenings, festivals and cultural events, on television, as a series of short films, online, social media, video-on-demand, DVD/ Blu-Ray, photography exhibitions and smartphone apps. RHD is preventable, but it currently affects over 30 million young people worldwide. Take Heart reveals the incredible true-life stories of young people living with RHD, their families and health workers caring for them. The stakes are high for these kids, RHD is life-threatening and they must comply with strict medication schedules to stay alive. Regular health checks, restricted activities and frequent hospital admissions are commonplace and they rely on the support of their family, friends and community health workers to keep them on track. This is not easy as most young people living with RHD are from poor, disadvantaged and often remote communities. Perhaps this situation is made worse knowing that RHD is 100% preventable. Follow Take Heart on social media to stay up to date or sign up to our newsletter. Find out more & sign up for updates.